I was walking through Skopje to discover the latest monuments and buildings I had not seen since being in town last year. The stroll through downtown took me down the main pedestrian stretch to the old train station, looking for the new head quarters of the ruling party. Down a side street I glanced at a new old building. Walking towards it, I was overwhelmed by the large columns of the building, the ministry of finance. Approaching the building, I went up to the columns and touched them, they felt too massive to be be true. And they were not. Knocking on them, they were hollow, made of plaster. And then it dawn on me, what I have been watching over the years visiting Skopje is not a giant process of reconstructing the city, changing its cityscape, but the government has been building a stage. Like in a theater play, these new buildings are new architecture, looking old, but they are a backdrop of a play, a tragedy. Wherever you look, the buildings are shallow, they cover up older, more modern architecture, like the Archeological museum hiding the modernist opera. 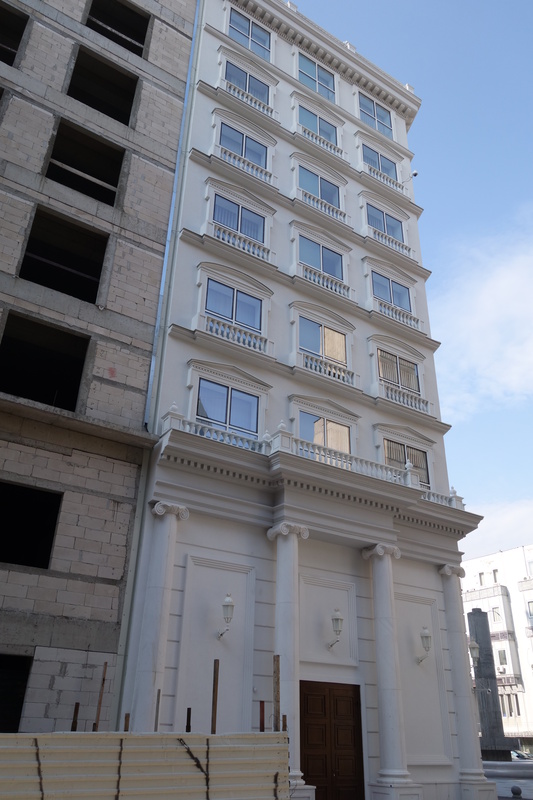 Even the new pompous building of the ruling VMRO, just a few meters away from the ministry of finance, is only a few windows deep (for now). 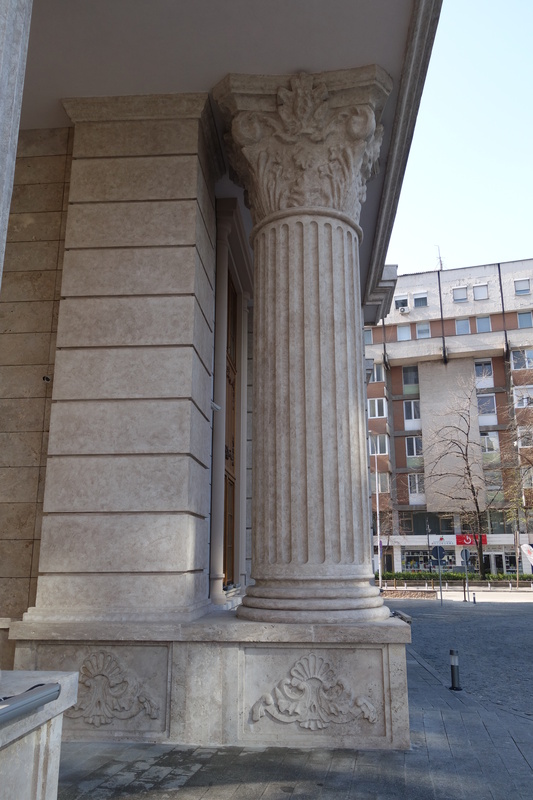 Unlike at the ministry, here the columns are made of real stone. Is it telling that the ministry is adorned with plaster columns, the state is fake, but the party is real? 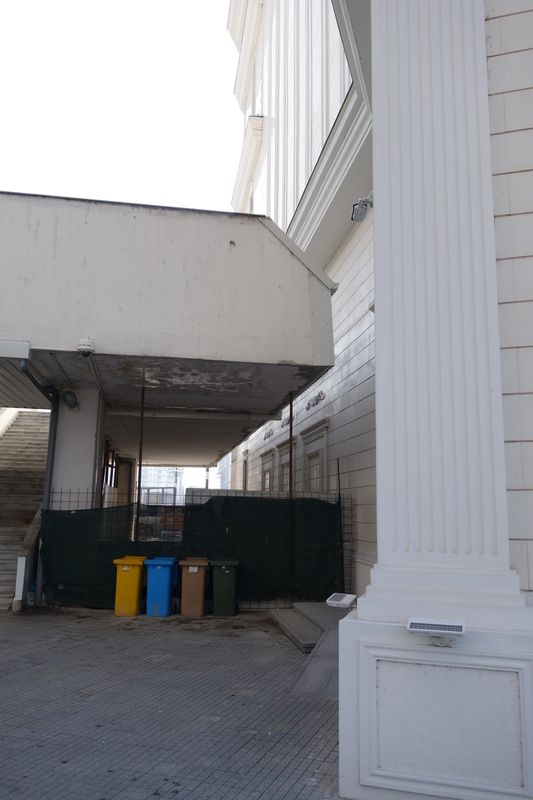 This is the stage–and considering the quality of many of the buildings–it is temporary on which the current Macedonian tragedy is set: the government, the opposition as the main actors and a chorus of international actors. While Greek tragedies contain a catharsis as its integral part, we don’t know yet whether this play will provide for it. The government might survive, outlive the accusations of corruption and abuse of office, or it might eventually falter amidst the accusations, mobilization of opposition, defection from within or external pressure (not discernible at the moment). Whatever the outcome of the crisis (I have written up some thoughts of how to overcome it), the stage will remain. Will it decay and be a reminder of a 7 year folly and a warning what a government without scruples and obsessed with nation building on speed does or will it continue to be a prop for a new national narrative that extends from buildings to textbooks, to public discourse? The fake columns suggest at least that this stage will require continuous maintenance to sustain itself, and this gives some hope.